Trackball mice are often viewed with an air of suspicion. But, their benefits over traditional mice, in our opinion, far outweigh any negatives they have. Not only are they much more precise, easier to use, help reduce wrist strain and RSI, but they are also very portable and able to work on any surface. That’s quite an impressive resume. With this in mind we have created this guide on the best 6 trackball mice available in the UK. We’ll review the pros and cons of each trackball mouse provide you with all the info you need about how they compared to regular mice and what to bear in mind before buying one. If you are shopping for computer peripherals, Logitech is one brand you can count on to offer a good selection of choices. 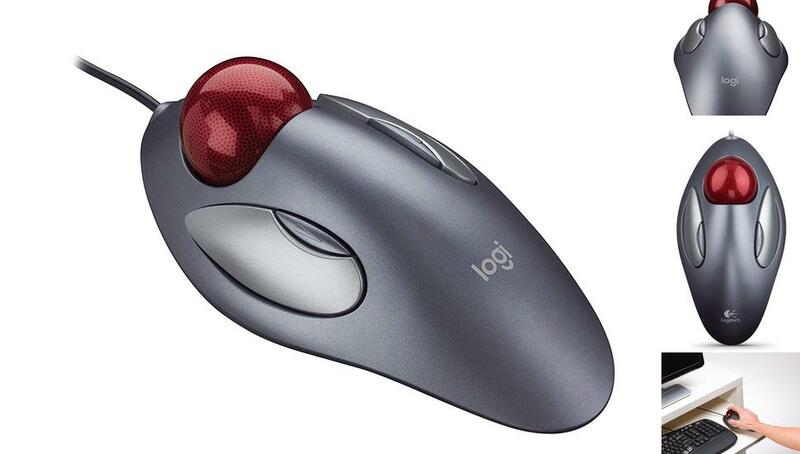 More so, if you are looking to buy a mouse since the Logitech brand is best known for producing impressive trackballs. 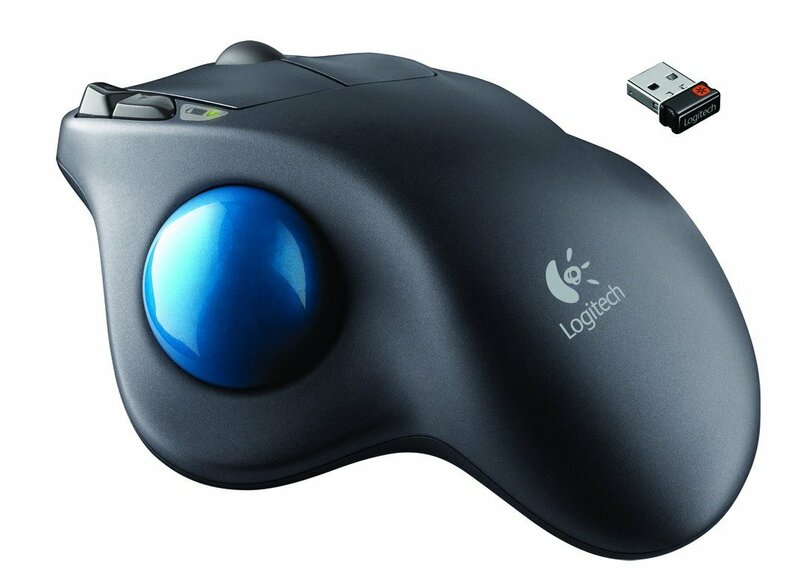 And, one great example of the brand’s prowess in mouse products is the Logitech M570 wireless mouse trackball. Despite having been on the market long enough to surpass Logitech’s typical product lifecycle, the M570 still remains to be a popular pick among trackball enthusiasts. This speaks volumes about just how useful and well made this product is. With the Logitech M570, comfort is the entire basis of the mouse’s design. It all starts with the trackball mouse itself, which is designed to stay in one place, thereby ensuring your arm will never have to move when using the device. Plus, the Logitech M570 is a thumb-operated trackball that has all its buttons conveniently located within easy reach of your fingers. However, the best part of the Logitech M570 trackball design is its shape. Sculpted to support the hand, the M570 is designed to be wider than a typical laser mouse. This shape allows the hand to spread out into a more natural position whereby the left part is slightly higher than the right side of the hand. As a result, you end up experiencing greatly reduced wrist strain when holding the mouse, which means you can use it for hours on end. The Logitech M570 also includes a tiny, very convenient 2.4GHz USB receiver. This receiver not only facilitates the M570’s wireless operation but also allows you to control your computer from as far as 30 feet away. It also uses Logitech’s Unifying technology, which enables you to connect to up to 6 compatible wireless devices (keyboards, number pads, etc). And, the great thing is that the USB receiver is so small you will barely notice it is there. What’s more, the wireless receiver can be safely stored away in the bottom of the mouse when not in use. The wireless Logitech M570 has a total of 5 buttons (including the scroll wheel) all of which are situated in such a way they can be accessed effortlessly. The device’s ball is positioned comfortably beneath your thumb while the rest of your fingers are left free for pressing buttons. The two main click buttons are fairly large, easy-to-press, and will respond even when pressed with the pinkie/small finger while 2 smaller more solid and equally responsive back and forward buttons are placed to the left of the device within close reach of the index and middle finger. These 2 extra buttons can also be customized to your liking by downloading Logitech’s Control Center (for Mac) or SetPoint (for windows). Like all thumb-operated trackballs, the M570 has its scroll wheel located in the middle of the device right where your middle finger will rest. The wheel is made of a soft rubber that delivers a nice feedback even with a light touch. The Logitech M570 is beautiful, extremely comfortable, and comes with buttons that can be customized to the user’s liking. This makes it a great pick for pretty much anyone who spends long stretches of time on a PC or laptop. The mouse even comes in a nice compact size that will prove useful if you are tight on desk space or when you need to use your mouse on different surfaces. 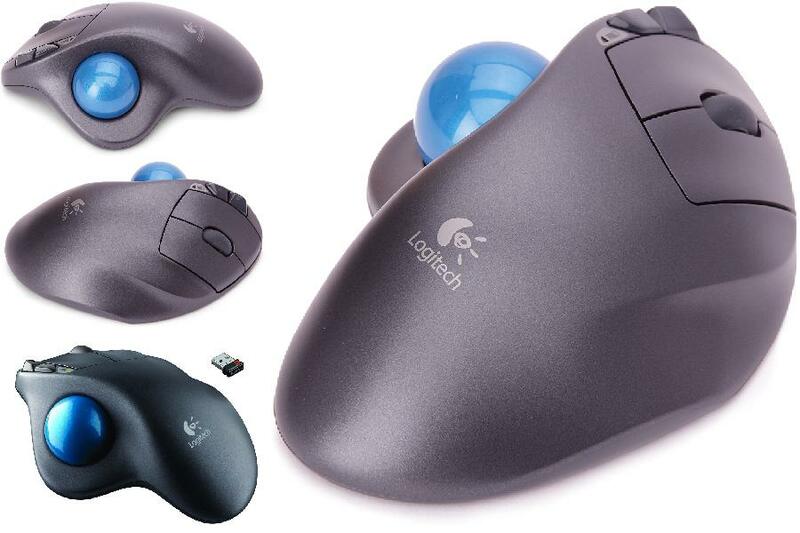 Introduced into the market in 2004, Logitech’s Trackman Marble trackball mouse has been around for more than a decade. Many people fell in love with its ergonomic curves and sleek appearance, and hence it has continued to be a top seller. The trackball’s design has remained largely the same over the years but a few improvements have been added to make it more functional. The Logitech Trackman Marble is a cabled trackball mouse. It offers the flexibility to work with older and newer PC models since you can use an adapter on the cable end to switch between a USB and PS/2 connector. It’s designed to function with optical sensors with a resolution of 300DPI. As a result, the trackball has dots on the surface that aid in detecting and intercepting cursor movements. The trackball’s long and sleek ergonomic design mimics the hand’s natural shape which tapers down into a long tail section where you can rest your palm comfortably. The Trackman Marble features a 40mm sphere. The dotted red ball is smaller than what the Kensington Expert has to offer but larger than that of the Logitech M570 or Kensington Orbit Optical. Making it an ideal trackball for small to medium-sized hands. All buttons are conveniently positioned to the sides of the mouse while the trackball is mounted dead center at the front of the mouse. So, if you prefer thumb trackballs this might not be the mouse for you since the ball is moved with your fingers – which some people can find a little unusual to begin with. The updated version of the Trackman Marble now features four buttons instead of two, as was the case with initial releases. The generous-size buttons on each side control right-click and left-click action. One is meant to be clicked using your thumb and the other side using your ring or small finger. The click buttons provide haptic and mechanical-audio feedback when pressed and push down with a satisfying ‘click’. Two new small buttons positioned just above the large ones are set to instigate back/forward commands, which come in handy when browsing web pages or navigating through folders/directories on your computer. However, you can reconfigure the extra buttons to perform other common functions. For this, you will need to install Logitech’s SetPoint customization software if you are a Windows user or Logitech Control Centre app for Mac OS. The designers at Logitech used textured plastic for the mouse housing, which does not get too hot to hold. They also placed three skid-resistant pads on the bottom to keep the Trackball Marble stationary when in use. One of the biggest downsides of this trackball mouse is the lack of a dedicated scroll wheel. You would think that without a scroll wheel, this makes the Logitech Trackman Marble trackball mouse less functional. But, scrolling function may be assigned to the existing controls in a couple of ways. For instance, you can program the small buttons to scan up and down pages when pressed instead of executing their default back/forward function. Alternatively, you can set the trackball to serve as the scroll wheel when rolled vertically. One of the small side buttons would then serve as a trigger, which when pressed switches the trackball between scrolling mode and normal cursor movement. Logitech’s Trackman Marble is a decent entry-level choice for people who want to transition smoothly from the regular mouse to a trackball. The trackball’s symmetrical design means you can use it regardless of your dominant hand. It could also help people who suffer from repetitive strain injuries and want a mouse that they can operate without constant discomfort. The Kensington Orbit is a fantastic trackball mouse that strikes a good balance between comfort and control. Its central mounted sphere is suitable even for left-handed users plus buyers get an extra accessory which helps keep the wrist in a neutral position. This trackball is a plug & play device that comes ready to use right out of the box. It’s compatible with Mac and any Microsoft operating system from Windows XP and higher. On the surface, the Orbit trackball does not look as intimidating as some of the button-laden thumb-operated models. It pretty much looks like an oversized mouse with a large 40mm protruding ball on the top. The blue central rolling sphere on this version offers the symmetrical design that both right and left-handed people will find comfortable to use. The rolling ball is flanked by one button on either side to allow for easy clicking actions. Fixed around the ball is a ring that controls scrolling function. Another nice addition to the design is the rubberized wrist rest included in the package. This accessory offers extra support for your wrist when looking to maintain a comfortable position. Although it takes up more space, the wrist rest can be removed should you need a bit extra work space. As the name implies, the orbit trackball wired mouse is not a cordless device. Therefore, you don’t have to worry about internal batteries running out as is the case with wireless trackballs, although you do miss out on the freedom that wireless devices can provide. That said, the USB cable is almost 5-feet long, so this does still offer you plenty of wiggle room. As mentioned above, the wired Kensington Orbit trackball mouse only offers two buttons. The buttons are failry large and this makes it easy for users to reach them with either the thumb or small finger. By downloading the KensingtonWorks software, you can customize the trackball buttons. This makes it possible to switch the functions of the primary and secondary buttons to match your hand orientation or program the trackball to carry out a specific task when you click both buttons simultaneously. The clever scrolling mechanism on the Orbit optical makes it stand out from the crowd. Instead of using a scroll wheel, this device features a ring spun around the trackball. To move up and down web pages or documents, simply turn the ring clockwise and counterclockwise. Unlike the scroll wheel on a mouse, the ring does not make any noises. Its rubberized texture also has raised marks that improve grip when scrolling – so you won’t need to worry about your fingers slipping. There aren’t many trackball mice on the market for left-handed users. So, the Kensington Orbit optical addresses this problem with its central mounted scrolling sphere. 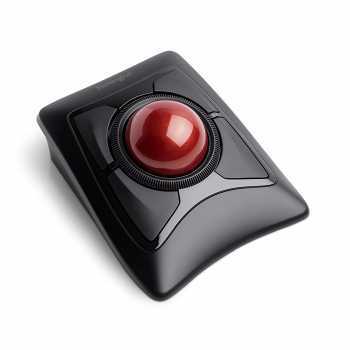 Whether you are left or right handed, this symmetrical finger-operated trackball will feel comfortable to use. Overall, it is a great budget option to introduce anyone to trackball mice without breaking the bank. Anyone who has ever gone on a trackball mouse hunt will tell you that finding the perfect fit is not easy. Sometimes you will find an option with the exact design and functionality you are looking for only to discover it is too small or big for your hand. Other times you can come across a trackball mouse that is perfect for your hand but whose functionality does not suit you personally or your computing needs. Whilst you can be tempted to settle for the next best option, which meets most but not all of your needs, we suggest you take a look at the Perixx PERIMICE-517 Wired Ergonomic Trackball Mouse instead. Assuming of course that you are right-handed. Perfect in more ways than one, the PERIMICE-517 is comfortable, highly responsive, amazingly accurate, and even has a versatile build that allows it to adjust to the user’s needs. Although all trackball mice are designed to reduce hand movement, the Perixx PERIMICE-517 is in a class of its own. It features an ergonomic design that offers a natural-shape platform that supports your hand. So, instead of exerting effort trying to hold onto the mouse, your hand will actually be resting comfortably on the mouse. Since the mouse is designed to sit on any surface without moving around, there will also be no strain on your wrist or palm. Another feature to love about the Perixx PERIMICE-517 is that it comes with not just 1 but 2 interchangeable 34mm trackballs. One trackball features a matte coating that is specially designed to give you complete control when perusing through large files like excel sheets and massive documents. The other trackball has a glossy coating that is perfect for gliding quickly through pages. Whether you are an avid gamer, a web designer, or someone who is simply looking for more from their mouse, the PERIMICE-517 will be able to meet your needs with its wide range of buttons. In addition to the scroll wheel and the usual 2 click buttons that most trackballs feature, this mouse adds 4 more buttons. The main buttons feature a silent design while the extra buttons can be personalized to your liking in the Windows Control Panel. The device’s user manual gives clear instructions on how to customize the buttons. For an easy time browsing through long lists, documents, and web pages, the PERIMICE-517 offers a solid scroll wheel that sits in between the device’s click buttons. The scroll wheel also has middle click functionality that can be turned into one more button on the device. 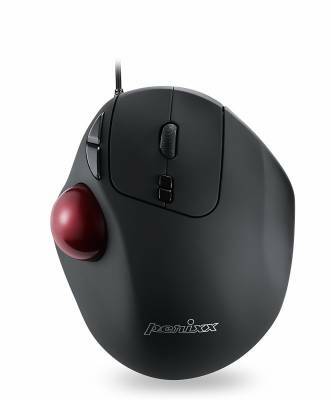 Aside from the fact that those who are left-handed cannot use it comfortably, the Perixx PERIMICE-517 trackball mouse is a brilliant all-rounder. It is user-friendly right off the box (simply plug-in and use), highly accurate, and allows you complete control over functionality. These are 3 amazing qualities that will prove very useful regardless of what you will be using your mouse for. And, the fact that mouse is designed to supports your hand for the utmost comfort during use makes it all the more worthwhile. 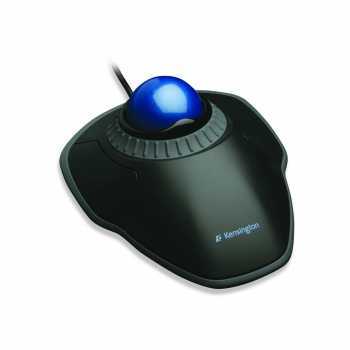 Stylish, comfortable, and easy to use, the Kensington wireless trackball Expert mouse has plenty of desirable features. 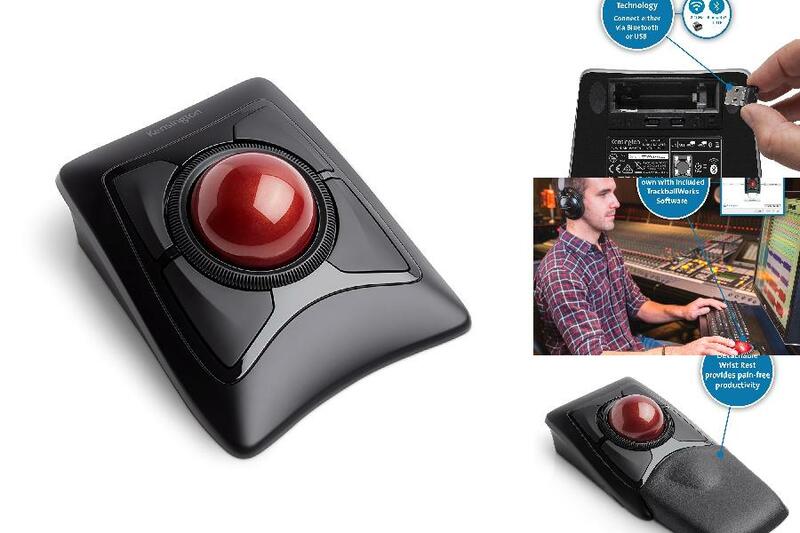 This finger-operated trackball will no doubt look great on your desktop. But, it has a lot more to offer than just great aesthetics. 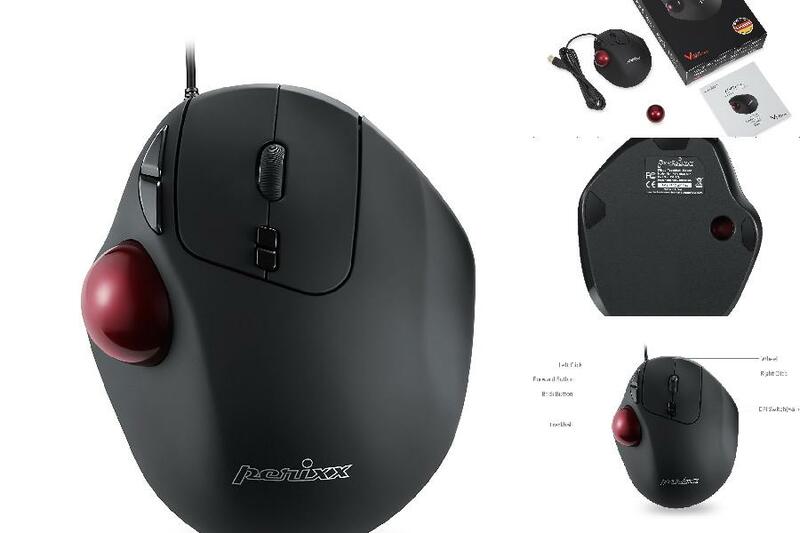 Here’s our complete buyer’s guide that delves deeper into the features, specifications and other pertinent details of this trackball mouse. 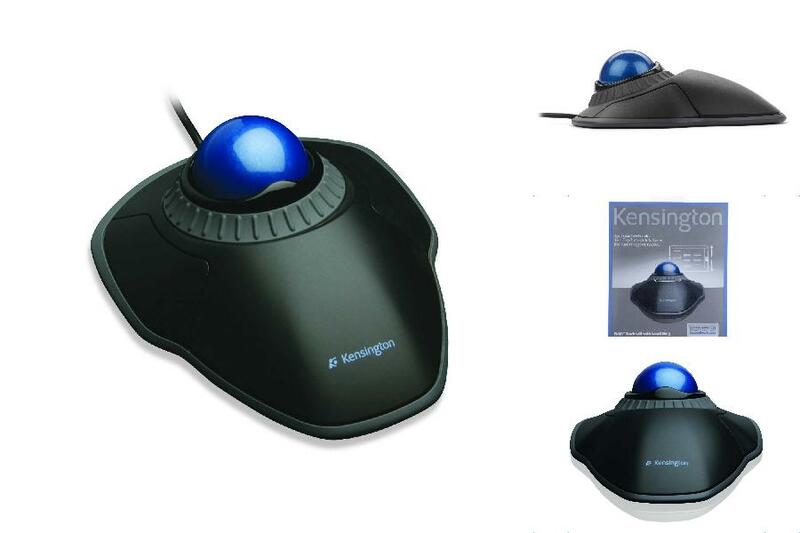 This model has many of the design features found on the Kensington Expert mouse wired trackball. These include optical sensors, four buttons, a scrolling ring and a 55mm symmetrical trackball that can be used comfortably with either hand. Unlike its all-black themed predecessor, the Kensington wireless has a red rolling sphere. In addition, its wireless operation gets rid of cable-clutter around your workspace. Two AA batteries power the mouse while in operation. An auto-sleep function powers down the trackball when left idle. You can conserve battery life further thanks to the on/off switch on the underside that will turn off the mouse when it is not in use. Another convenient feature is the LED light that blinks red to let you know that the batteries are running low. 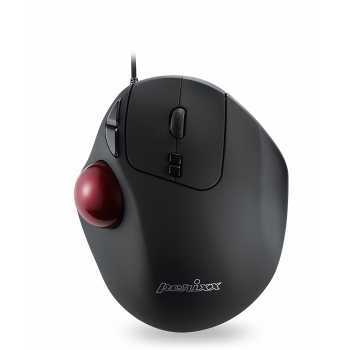 You can connect the Kensington Wireless Trackball Expert mouse to your computer in one of two ways. Simply slide the switch on the underside to swap between using the 2.4GHz USB nano receiver or via Bluetooth 4.0 LE. The latter connectivity mode eliminates the need for using a USB port on your PC, leaving room to connect an extra accessory. The caveat though is that your computer must be Bluetooth enabled. Pairing is initiated by holding down all four buttons at the same time. A blue LED light between the two front buttons continues to flash during Bluetooth pairing and turns off when the process completes. As an added bonus, this Kensington wireless mouse comes with a wrist rest. You can mount or dismount this attachment to the trackball base since it a detachable piece. It’s finished with leather rather than rubber, so people who are allergic to latex can use the wrist rest with confidence. Four buttons occupying the corners of this rectangular trackball allow for easy reach using your thumb, pinkie, ring and index fingers. Kensington offers a button customization application that is free to download from their website. The KensingtonWorks software allows you to change settings like scrolling speed and direction or program the upper buttons to perform a variety of common functions like copy/paste, zoom in/zoom out, or undo/redo. Like most Kensington trackballs, the Expert wireless version features a scrolling ring that circles the ball. Using your middle or ring finger, you can spin it to move vertically on website pages or long documents. The scroll ring’s tactile design lets you scan through pages without looking at the trackball thanks to its grooved surface that is easy to identify with a simple touch. The Kensington Wireless trackball Expert mouse offers a wide range of functions, making it a great choice for hyper-productive professionals. If you are looking to upgrade from a basic trackball, you will find the extra programmable buttons on this unit quite useful. The best part is that this plug & play device offers great compatibility. In fact, if your PC runs on Windows 7, Mac 10.8, Chrome OS 44 or higher versions of these operating systems, you won’t have to install any device drivers. With trackball mouse manufacturers trying to outdo the competition, many brands have gone to great lengths and came up with some really innovative ideas. 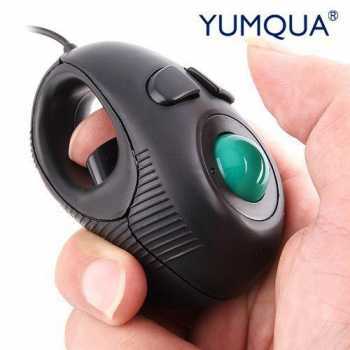 Take this little clever trackball mouse from YUMQUA for instance, which is a finger held device that you wear like a ring. It is available in several versions, which differ in colour and design. 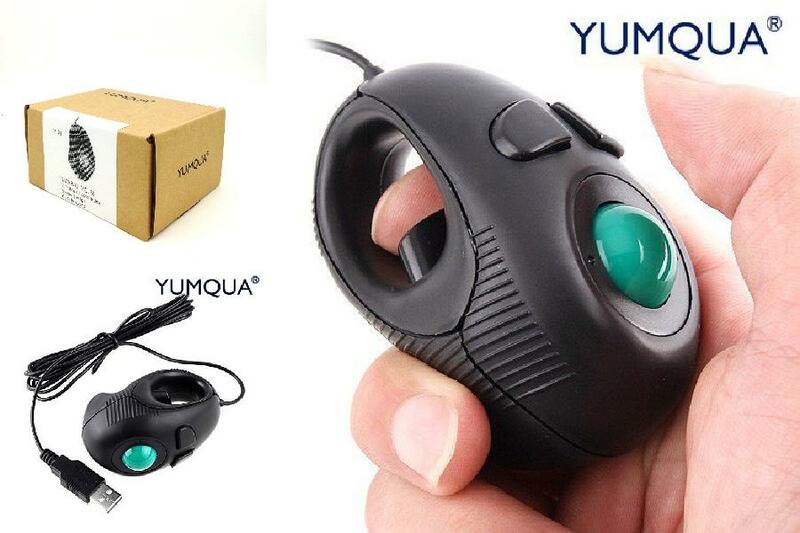 However, today we’ll be focusing on the YUMQUA Y-01 Portable Finger Hand Held 4D USB Wired Mini Trackball Mouse. Read on to get an inside scoop on what this little ingenious device has to offer. What makes the YUMQUA Y-01 unique is that you don’t need to place it on a desk or work surface when using it. It is meant to hold in your hand by wearing the device like a ring on your index finger. The trackball controls all the cursor movements when rolled around using your thumb. To use this wired device, simply connect it to the USB port on your PC, tablet or laptop. People with large hands might find this device difficult to use because the finger hole may not accomodate larger hands so easily. However, the tiny green trackball is very responsive for those who find this device comfortable to use. Some buyers recommend switching the ceramic ball that comes with the unit and replacing it with a 0.75-inch steel ball bearing, which would make the trackball less sensitive to small flicks. Since the ball comes off, this makes it easy to clean any dirt that may cause friction and impede cursor movements. 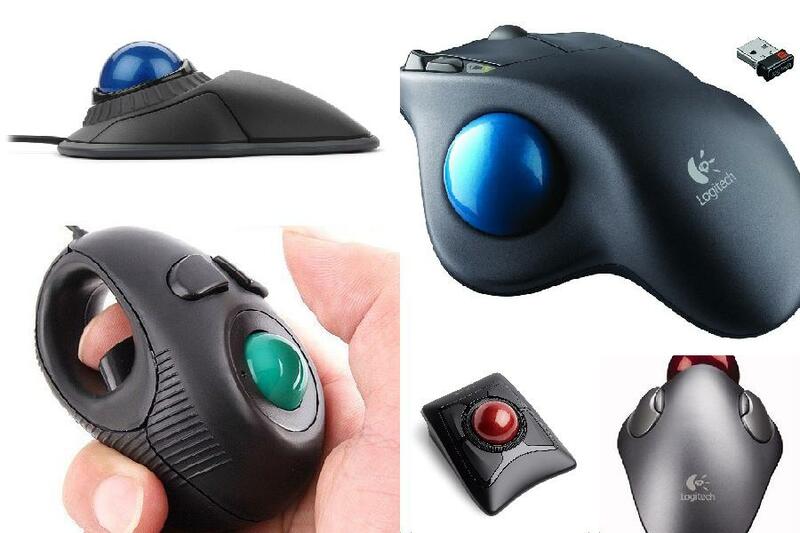 This finger held trackball mouse is compatible with a wide range of operating systems. It is Plug & Play enabled and starts to work right away when connected to a device that runs on UNIX, Linux, Windows, or Mac. There are three buttons in total on the YUMQUA Y-01. The trigger button inside the finger hole performs functions of the left mouse key. Simply press this button using your index finger to perform single click selections, place the cursor in fields, launch programs or open web pages in the same tab. Two other buttons above the trackball can be clicked using your thumb. The button on the left is equivalent to the middle-click mouse button. It executes the same functions a mouse would when you press the scroll wheel. You can click the left button to open webpage links in a new tab, close tabs on most browsers, or activate automated scrolling.The right button pulls up the pop-up menu that you would see on a screen upon pressing the right-click button on a regular mouse. To drag items, hold down the trigger button and roll the trackball to reach the drop destination. Although the YUMQUA Y-01 has no dedicated scroll wheel, you can use the middle-click button found on the left side above the trackball to activate auto-scroll. This allows you to scan pages vertically while rolling the trackball. Pressing the middle-click button again will exit auto-scroll mode. For users who find this method of scrolling difficult, it may be worth checking out the wireless YUMQUA Y-10L and wired YUMQUA Y-10 finger held mini trackball mouse models, which do come with a scroll wheel. The YUMQUA Y-01 finger-held mini trackball mouse is certainly not for everyone. Users will need to have good thumb dexterity for scrolling, moving the cursor and pressing the two buttons found above the trackball. As such, if you have arthritis in your thumb, you might want to look for an alternative trackball like the finger-operated Kensington Orbit Optical wired mouse. People who use the keyboard a lot also may have to grapple with the inconvenience of constantly picking up and setting the mouse down repeatedly since it would get in the way if worn on the index finger when typing. However, this mini trackball mouse is great when you just want to sit back, relax and play music or browse the web. People who find touch screens hard to use will enjoy using this device, but you need to connect it to your tablet via an OTG cable. The trackball comes with a 2-metre long cable, which makes it great when giving a PowerPoint presentation. Overall, it is a fantastic travel mouse that comes at a very affordable price. There are many benefits to owning a trackball mouse. This type of peripheral device is easy to use, offers more precision than a regular mouse, and best of all, it works efficiently on any surface. What’s more, a trackball has an ergonomic design that allows you to simply sink into a comfortable position, hone in on your computer’s monitor, and let your fingers do all the work. Your arms and shoulder won’t need to move while your wrists will only be engaged in minimal movements. This means you will not suffer from the arm, shoulder, and neck aches that come from engaging in the unnatural hand movements that some ordinary mouse designs force you to maneuver. So, if you spend most of your days behind the screen of a desktop computer, trackball mice can make your life so much easier. But first, you need to find the best option for your needs. The great thing about shopping for trackball mice is that there are plenty of options from which to choose. However, the selecting a trackball that allows you to work in comfort should be your number one priority. The mouse you end up buying should fit your hand perfectly and also meet your computing needs, giving you a strain-free and effortless time when using your laptop or PC. The good news is that finding the perfect trackball mouse only requires 4 simple steps. The search for the perfect trackball begins with choosing the design that will suit you personally. Options include thumb and finger operated models. 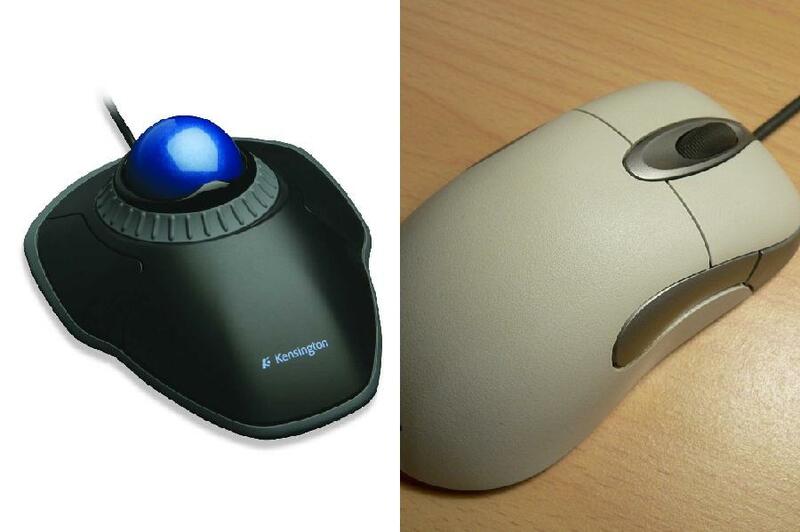 The thumb-operated trackball is a huge favourite among computer users because its ergonomics are very similar to that of a standard computer mouse. It features a small ball at the left or right side, which you will control with your thumb – hence the name. As such, it is important to choose a thumb operated trackball mouse while taking into account your hand orientation, that is whether you are left or right handed. With a thumb operated trackball mouse, your index and ring fingers will rest on click buttons (much like they do with a standard computer mouse), while your middle finger will rest on a scroll wheel, which sits at the centre of the device. Some thumb-operated trackballs may have more buttons on the device. On the other hand, finger operated trackballs, have their ball, which is much bigger, situated at the centre of the mouse. This design gives the user greater precision since the ball is not only bigger than that of a thumb-operated trackball, but you can also control it with either your index or middle finger. The rest of a finger-operated trackball consists of thumb, ring, and pinky finger-operated click buttons located on both sides of the mouse and a scroll wheel that can be installed at the top or side of the device. The scroll button can also be fashioned into a scroll ring fitted flat around the device’s ball to look like a dial. 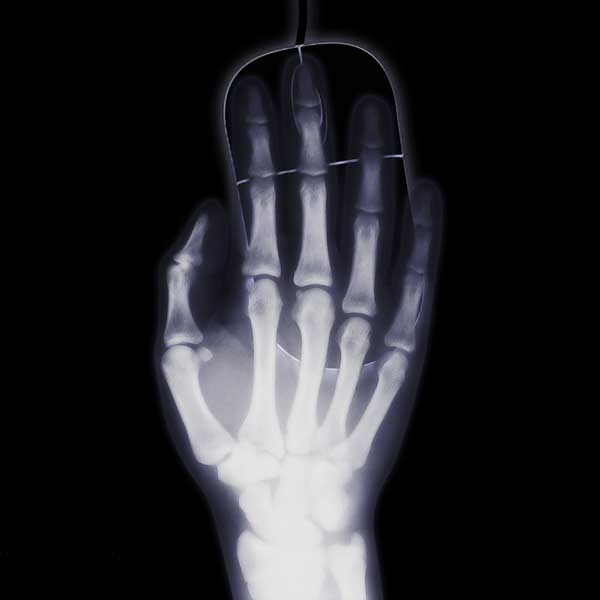 Due to the central position of the ball on a finger operated trackball mouse, these devices tend to be ambidextrous (suitable to use with any hand). 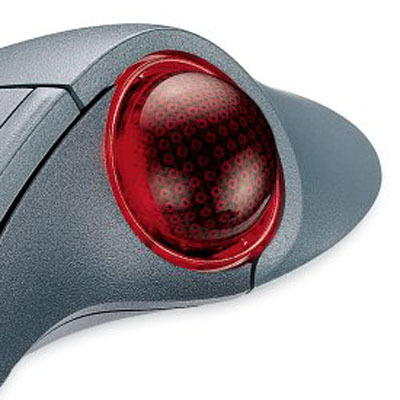 Some trackball mice can feature a lot of programmable buttons – but how many will you need? With some trackball mice offering as much as 8 buttons, it is important you figure out how many buttons you need before you start shopping. For this, you simply need to consider how you plan to use your trackball mouse. If you are looking for a mouse for basic computing and browsing through websites, 3 buttons (for clicking, right clicking & scrolling) are really all you need. However, if your computer uses complicated software, you may need more buttons. The same goes for gamers and software developers. If you decide to go with a multi-buttoned trackball mouse, look for one that allows you to customize the buttons to your preference. In addition, pay close attention to the arrangement of buttons. Ideally, select a trackball mouse with buttons that are positioned in a way that makes it easy for you to operate the device. This is another choice you will be faced with when shopping for a trackball mouse. Wireless trackballs communicate with the computer via a 2.4GHz receiver inserted into one of the USB ports instead of a cable. For many people, wireless trackball mice are more preferred over their cabled counterparts because they help to declutter any workspace by reducing the number of wires connecting to a PC or laptop. That said, a wireless trackball also runs on batteries, which have the potential of running out, sometimes unexpectedly when you are rushing to meet the deadline for a major project. This is something to consider when deciding whether to go for a cabled or wireless trackball mouse. Once you have decided on the type, look, and model of your trackball mouse, all that is left to do is to look for one that fits your hand perfectly. Generally, trackball mice come in small, medium, and large sizes to suit all manner of people. Check the product dimensions of any trackball before making a purchase to ensure it is the right size for you. Now that you know what to look for when buying a trackball mouse, it is prudent to shop around and look for the best products on the market that offer good value for your money. Quality is something you should look for in a trackball mouse. A good rule of thumb is; the heavier a unit, the better it will withstand a lot of use and/or abuse. 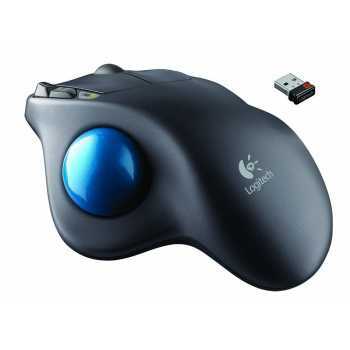 Shopping from well-known brands like Kensington and Logitech is also another way of ensuring you end up with a good quality trackball mouse. Apart from the obvious layout differences – how are trackball mice different to traditional mice? A pointing device for selecting and navigating through content on a computer is one of the most critical elements of any home or office PC setup. Most people choose to go with the traditional computer mouse for this purpose. A trackball performs all the functions of a regular optical or mechanical computer mouse. But, unlike the traditional mouse, you don’t have to move it when trying to reposition the cursor or screen pointer. Instead, you use your thumb, other fingers or palm to roll a protruding ball (usually fixed on top of the device to the side or at the centre) in order to make the screen pointer move. The difference in operation between these two types of computer mice boils down to the technology used to make each device function the way it was intended to. A normal optical or laser mouse relies on digital image processing technology to track the position of a mouse. Motion is detected by sensing changes in reflected light as you move your hand while dragging the mouse on a suitable surface. In contrast, optical trackball mice use infrared sensors to track the movement of a known pattern of dots covering the rolling sphere that is housed within a socket. Another distinguishing aspect about trackball mice is that some come with more than two buttons for clicking. In addition, other designs have a ring spun flush around the ball, which controls scrolling action when turned like a dial. However, if you are looking for something a bit more familiar, there are some models designed with the same type of scroll wheel found on a regular mouse. Despite having been around for as long as the traditional computer mouse, trackballs are overlooked due to lack of knowledge regarding what they have to offer. 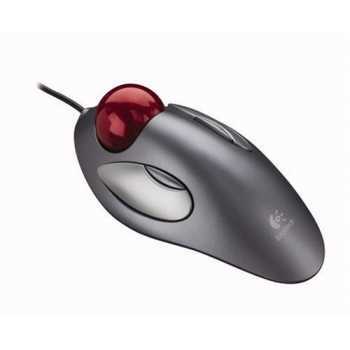 Trackball mice actually solve many of the annoying characteristics that are associated with traditional optical mice. The benefits of these peripheral devices can be summed up as follows. When using a regular mouse, you need to have ample space on your desk beside the keyboard. The reason for this is because you have to constantly glide the mouse across your desk to make the cursor move. On the other hand, the trackball remains stationary during use. You just need some room to accommodate it on your desk. As such, a trackball is a great choice if you have limited desk space or too many items that clutter your workstation. Moving an ordinary mouse across the desk when using a computer for extended periods can take a toll on your wrists. Trackballs are an improvement in that you don’t have to move your wrists so much since the thumb or fingers control all cursor/pointer movements. This goes a long way in reducing repetitive strain injuries. There are instances when an ordinary mouse falls short when it comes to precision or proves difficult to control. For example, you have to lift the mouse up and reposition it closer to the keyboard when you run out of space after moving the pointer across the screen. This can be tricky when dragging items from one spot to another. Often times, it proves difficult to keep the mouse button held down. In the process, you end up ruining everything and having to start all over again. With a trackball, you don’t have to rely on hand movements to complete mouse actions. Since the device remains stationary, this makes it easy to control. In other cases, you might select the wrong item from a drop-down list when the act of pushing a button makes a regular optical mouse to move. However, that won’t happen with a thumb operated trackball since the rolling sphere is completely isolated from the buttons plus any accidental twitches or jerks of the mouse will not make the cursor move. If you are a laptop user who finds a mouse pad too restrictive or lacks the space for a regular mouse when working away from a designated desk and you don’t like to use the touchpad, then a trackball would come in handy. The reason for this is that trackball mice work with great precision regardless of the surface you place them on. That is not the case with optical mice, which fail to function or move the cursor erratically when placed on arbitrary surfaces. Before taking the plunge and switching to the trackball, you should also be aware of the disadvantages that are associated with it. To begin with, getting accustomed to using a trackball mouse takes some time. In fact, you may have to deal with complaints from people who would rather use a mouse if more than one person uses your PC. Although using a trackball is going to feel awkward at first, learning to operate one is easy and becomes second nature once you get the hang of it. Another downside of trackball mice is that there aren’t many manufacturers, so you may find that your options are not as many with regular mice. Trackballs also typically cost more than the traditional mouse but the precision, ease of use, comfort and convenience they offer makes them worth it. The numerous benefits that trackball mice offer far outweigh the few downsides that are associated with them. People who suffer from carpal tunnel syndrome, arthritis, or arm/wrist pain would benefit the most by switching to using a trackball since it does not require a lot of arm movements. Graphic designers, web design professionals and other experts who use CAD (Computer Aided Design) programs can also improve efficiency with a trackball because of the precise pointer movements it offers. However, trackball mice are really ideal for just about everyone. You simply have to find one that best suits your needs. And, chances are you will never go back to a regular mouse after discovering the joy of using the trackball. We’ve covered a lot of ground. We’ve taken a look at each trackball mouse in turn, weighed up is pros and cons and looked over how a trackball mouse compares to a traditional mouse and covered a what to look for in the buyers guide.